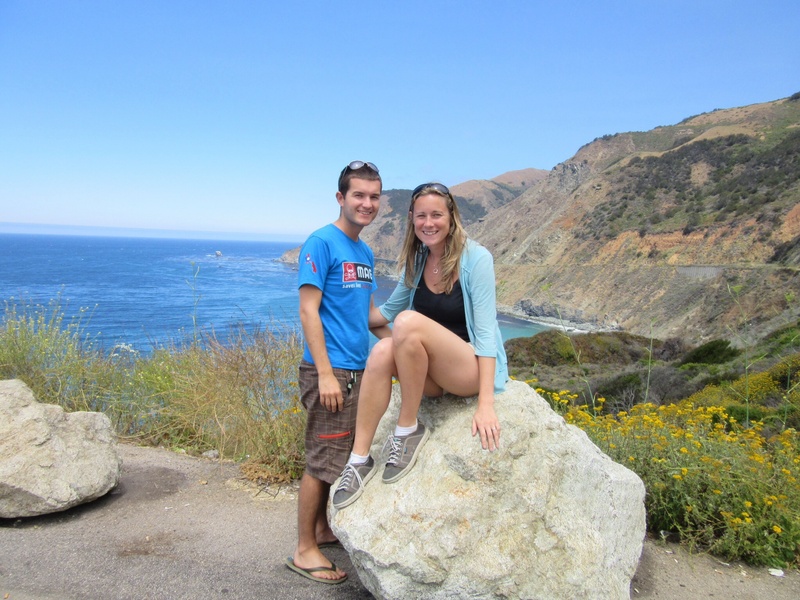 West Coast – the best coast? When we were in Beijing, way back at the start of this trip, a guy from San Francisco told us this when we were talking about travel plans. 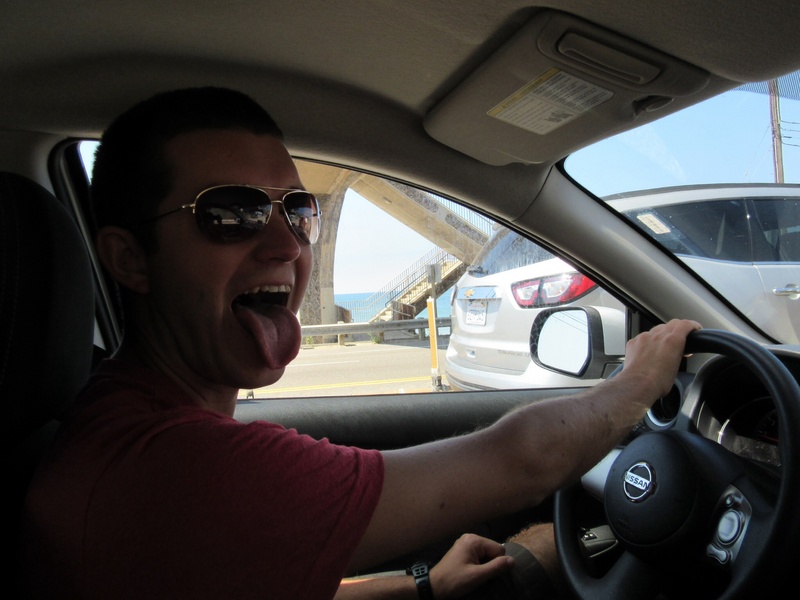 Almost a year later, and the west coast road trip has begun! 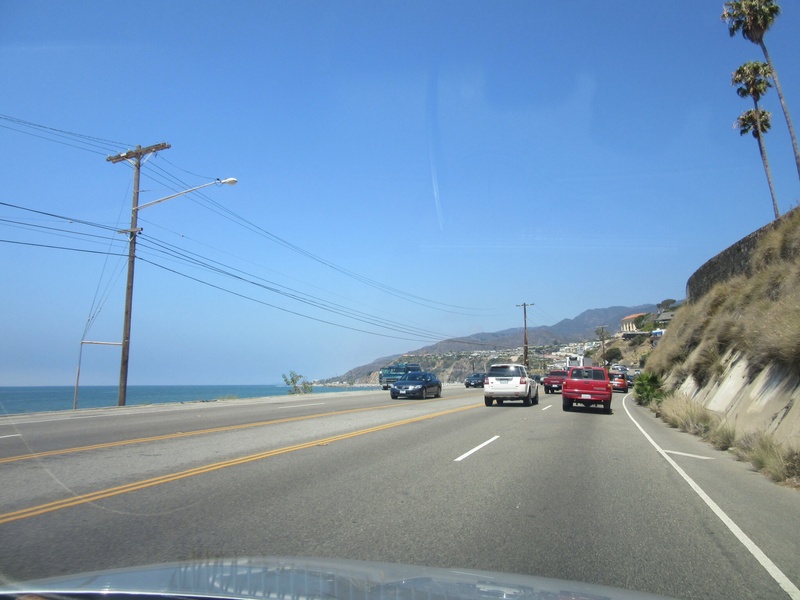 With LA in the rear view mirror, we started cruising up the Pacific Coast. 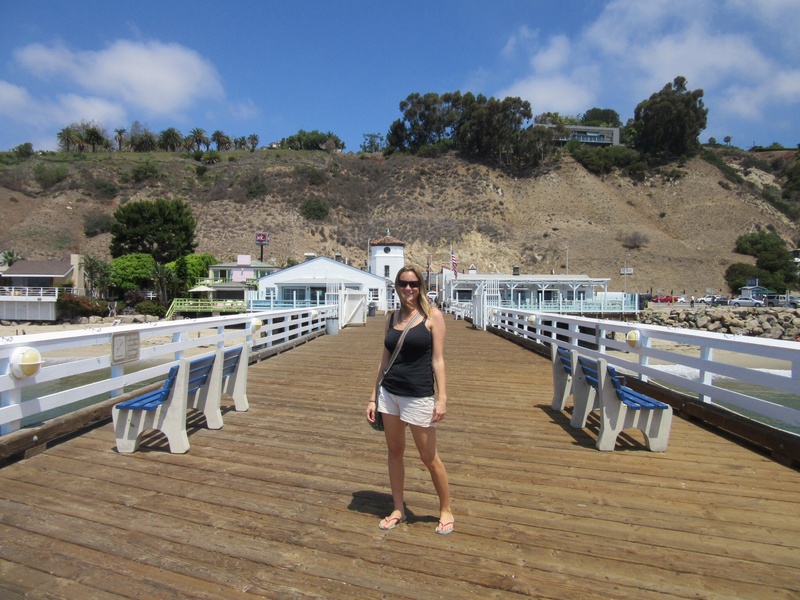 We didn’t get far before stopping in Malibu, strolling out along the pier and although we didn’t see any celebrity beach houses (we think), you can see why they’d live here. From there we pushed on north, the road winding around the coast making for some pretty special views, just an a few miles into the trip. 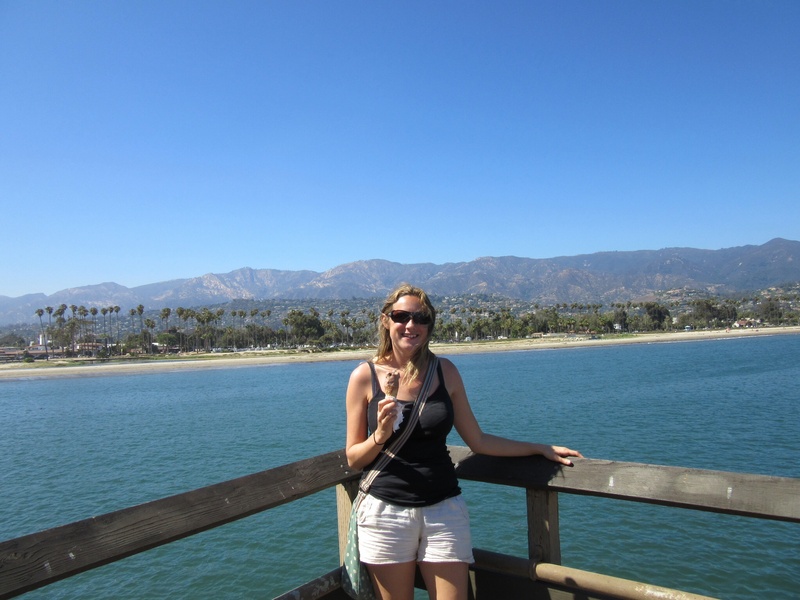 After a couple of hours we were in Santa Barbara and we decided to stop for lunch. Resisting the temptation for burgers and pizzas, and after wandering around the town for a while, we had a picnic on the beach before grabbing a nice ice cream on the pier. 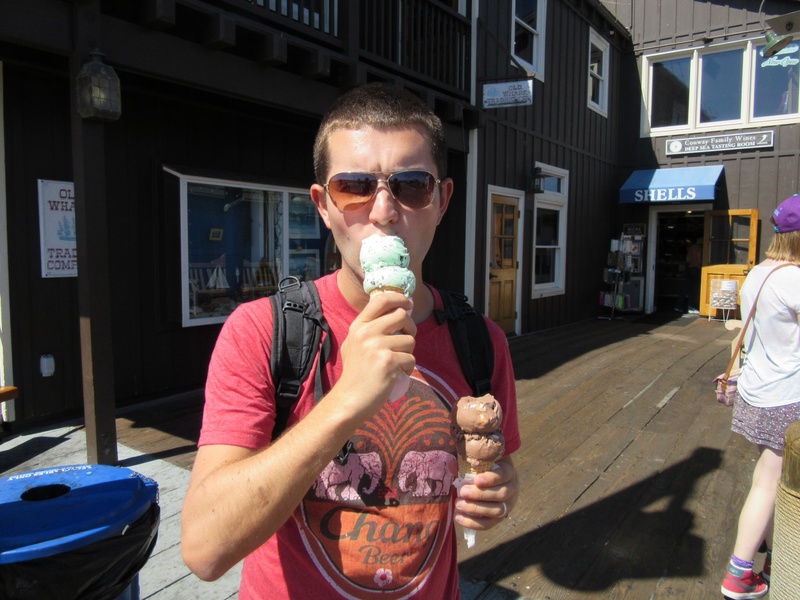 A small scoop is pretty big in America apparently. From Santa Barbara we left the coast for a bit and drove into Solvang, a bizarrely quaint little town. It was originally a Danish settlement, and retains a very Scandinavian feel, right down to the windmills and Christmas shop! We didn’t stay long though because our final destination for that night, San Luis Obispo, had a farmer’s market on in the evening. I think it’s the reason Law chose SLO for us to stay. 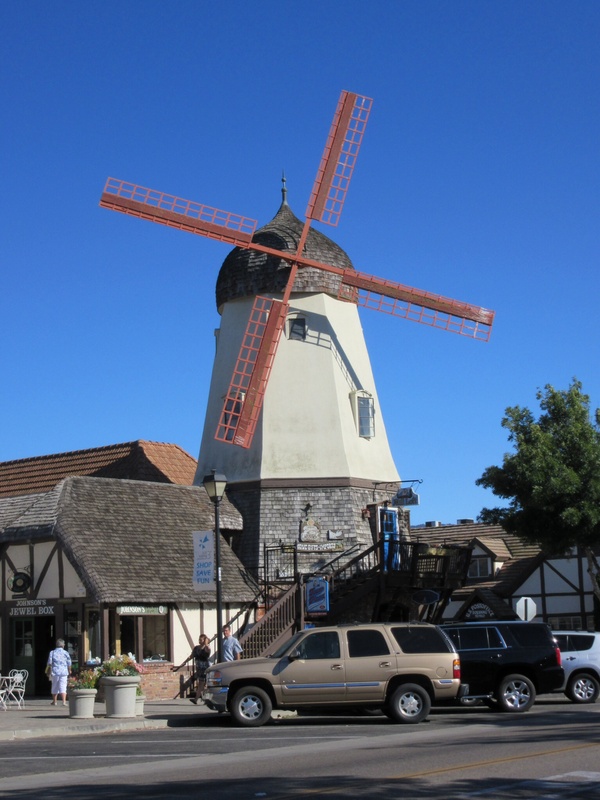 Solvang – are windmills Danish? It actually was a really nice town, and it was a good night to be there with the market on. About 4 or 5 blocks of the Main Street were totally full of people and stalls, with so much food to chose from! 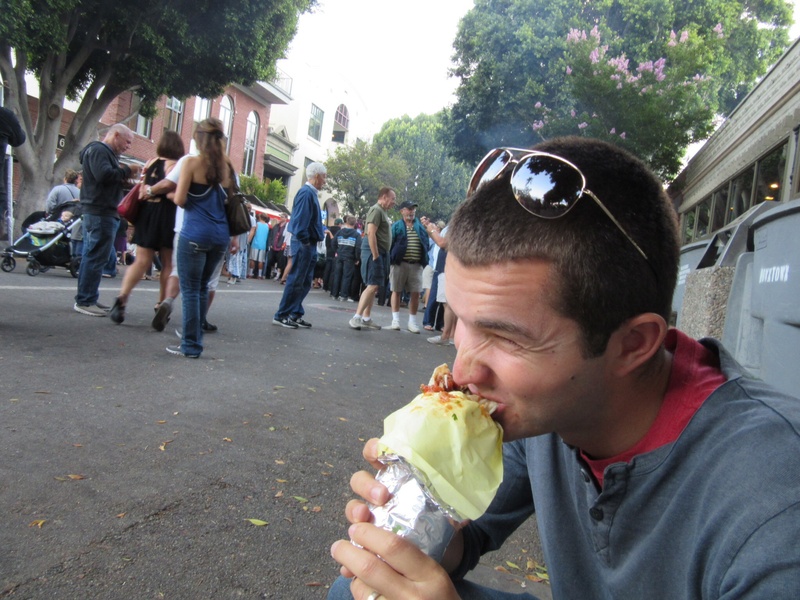 We ended up going with a burrito, and again what we thought was a small turned out to be huge. 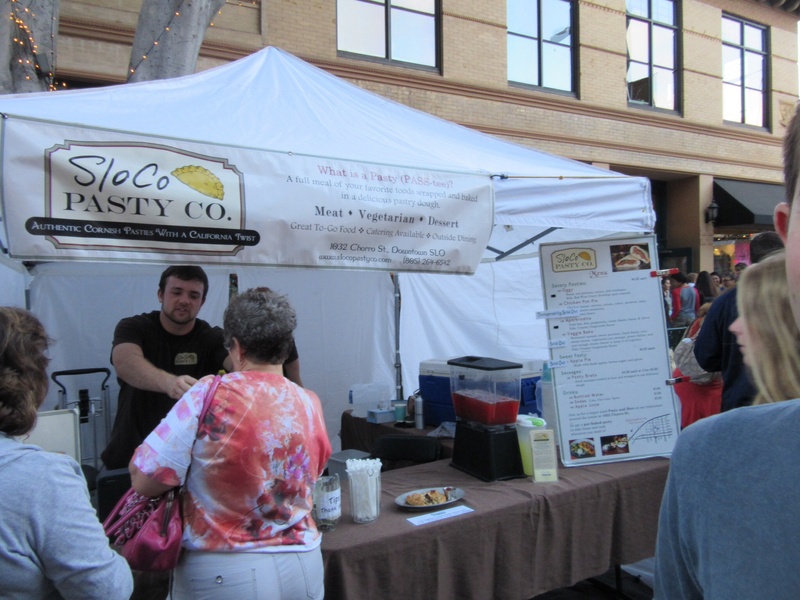 It was a good choice, but a tough call as we also saw, of all things, a stall selling pasties, albeit with a California twist. It wouldn’t have been right to try them, so we washed our burrito down with some cake and hit the sack. We didn’t cover much ground the next day, but did pack a lot in. 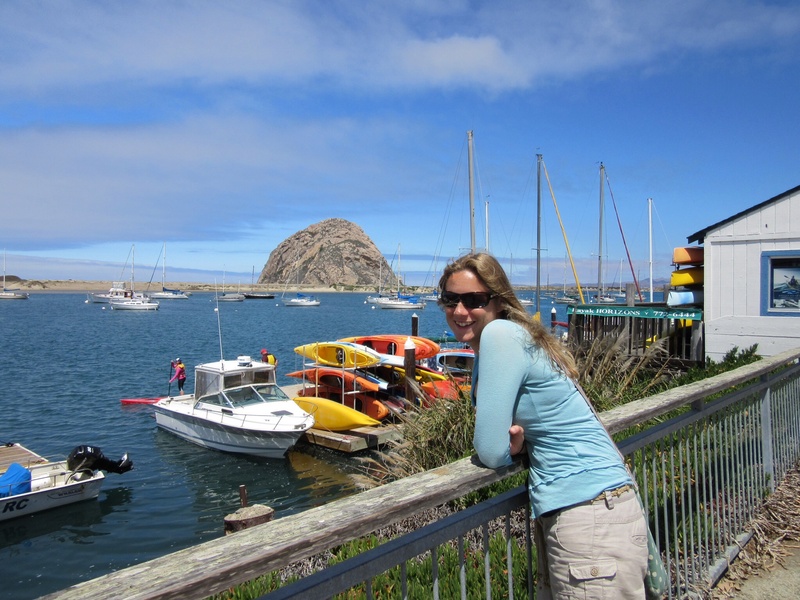 In the morning we went back to the coast and to Morro Bay, a cool little fishing town with a massive granite island / rock on the edge of the harbour. 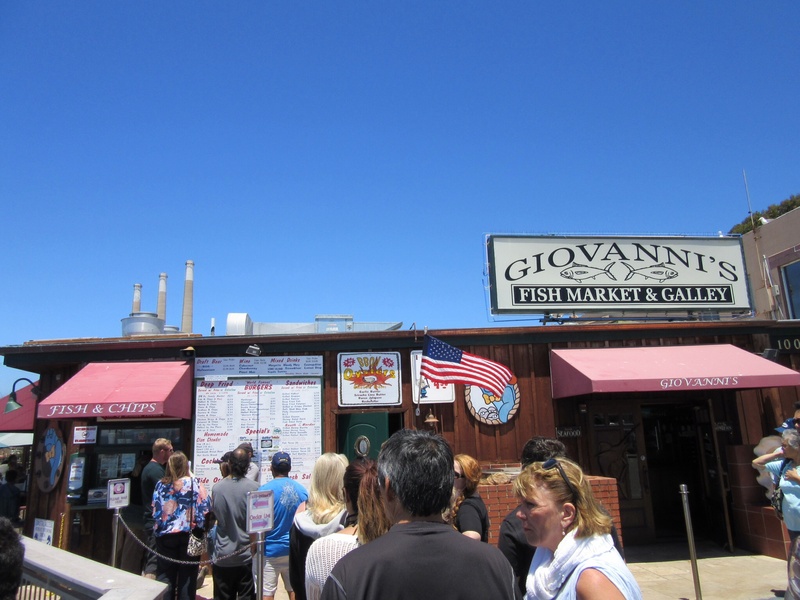 Watching the sailing boats and seals go by, we had some fish tacos and amazing garlic fries, and realised that America may not be the best place for healthy eating. After Morro, we went to Cambria, a really cool little town just off the coast where we’d be staying the night. 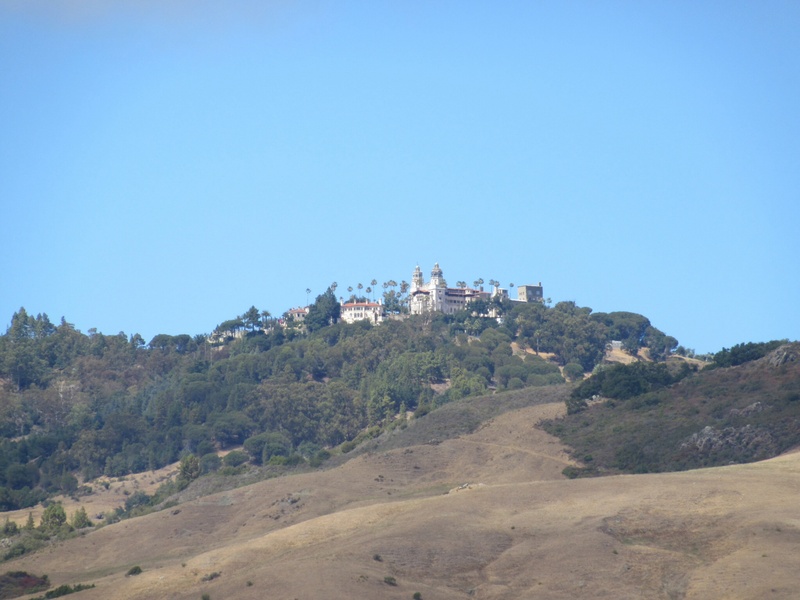 We weren’t done for the day though, as we’d booked tickets for a look around Hearst Castle about 10 miles away. It was mental. Insanely over the top opulence, with a bizarre mash of different styles and periods thrown together on top of a mountain. 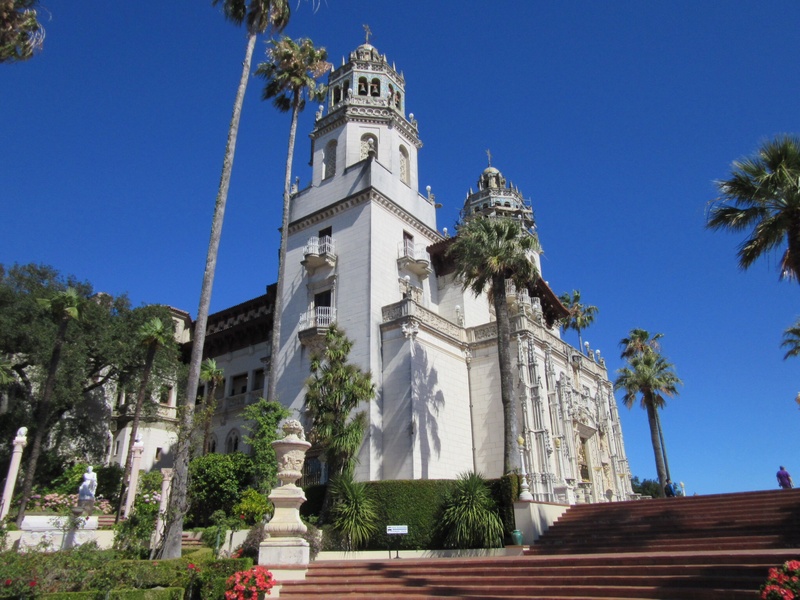 It was built by William Randolph Hearst, a newspaper magnate throughout the first half of the 20th century, the Murdoch of the day. The place was his west coast retreat, a ’ranch’ to entertain in and relax in. It took almost 30 years to build and was just nuts. From the road you can see what looks like palm tree ringed white palace, and once up the hill it just gets better. The front looks like a 14th century Spanish cathedral, with a mix of statues and bits of art decorating the building from all over the world and all over history. 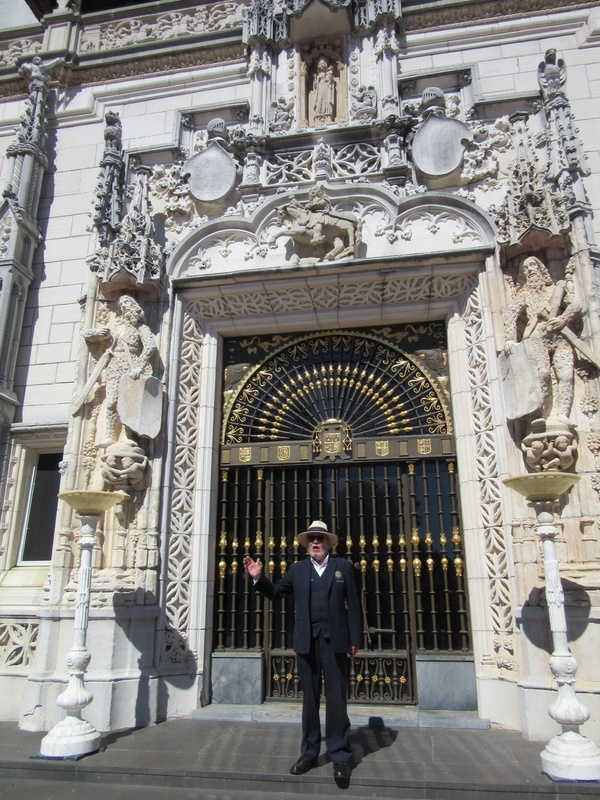 We had a tour of the ground floor, led by a guy who loved his job (and Mr Hearst), who passionately talked about his life and the building. 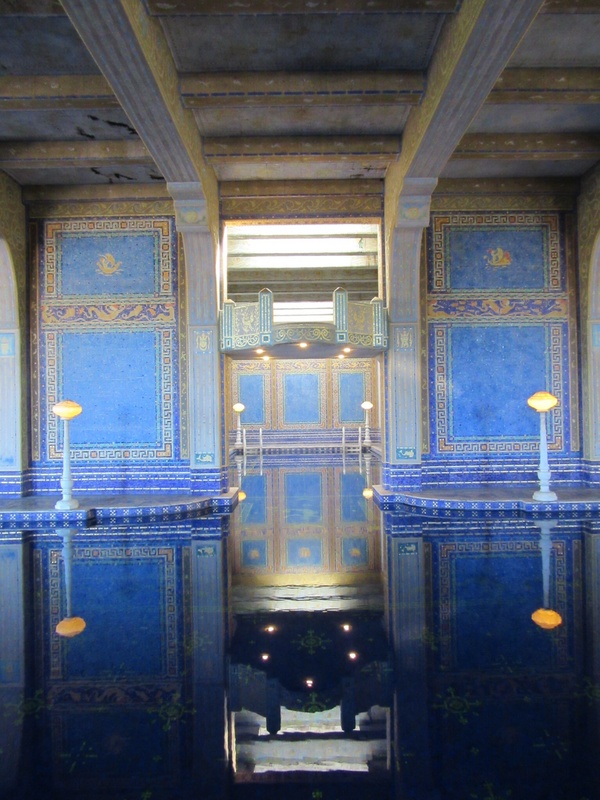 The insides are massive, stately rooms, filled with a range of historical and purpose made fixtures. 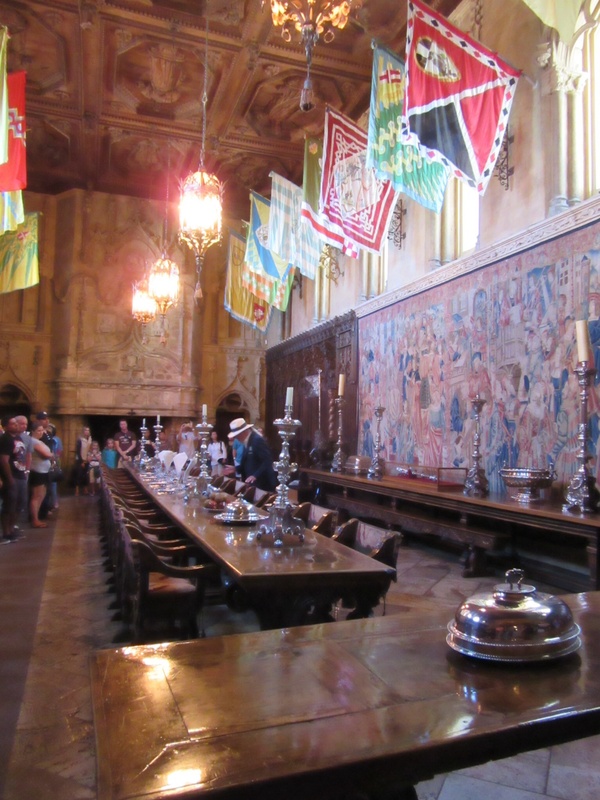 Huge tapestries and paintings cover the walls, ancient church choir seats “saved” are throughout, the ceilings are hundreds of years old and dining room looked like Hogwarts. Outside, tennis courts, guest houses bigger than normal houses, palm trees and a huge ’Neptune’ pool are surrounded by panoramic views of the mountains and sea. It was amazing, like being in a medieval episode of Cribs. Possibly more money than he knew what to do with, but a really fun place to visit. 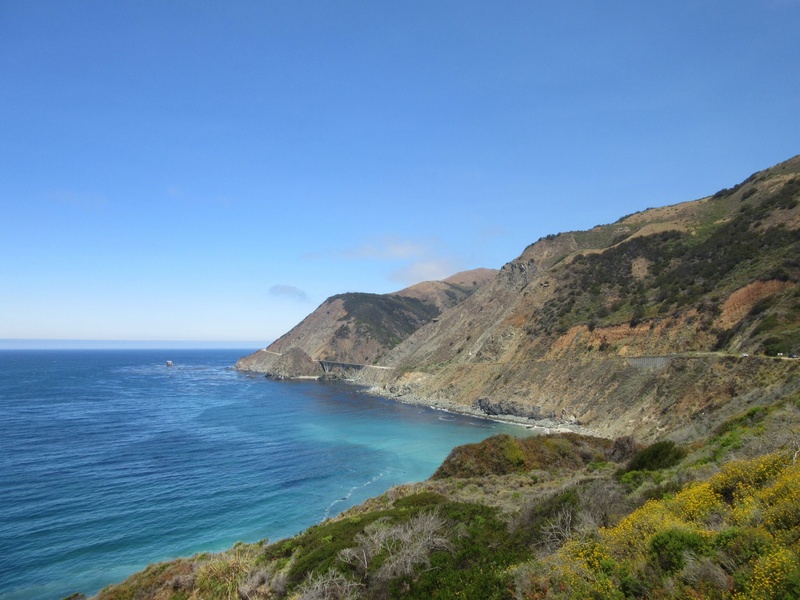 After Cambria, we spent the day doing one of the most famous stretches of road in the country, the Big Sur. 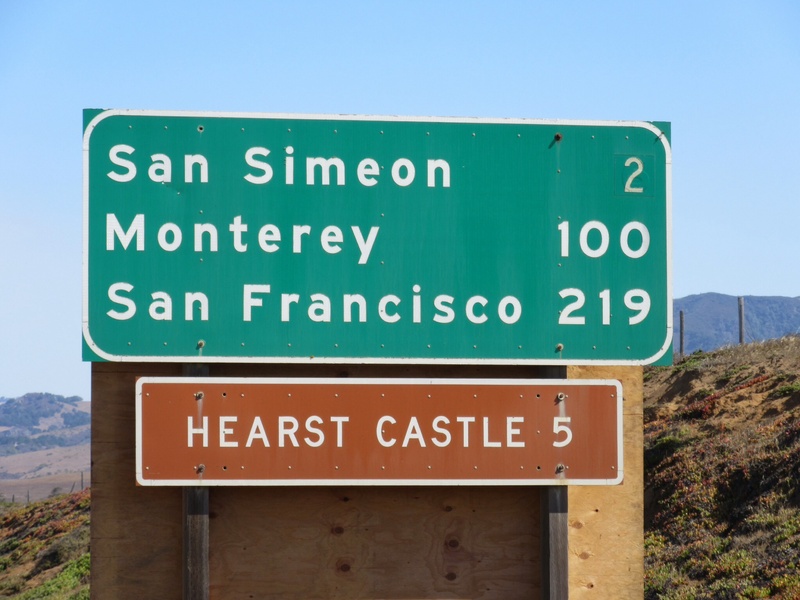 The road from Hearst Castle up to Monterey is about 100 miles, winding around the sides of mountains that drop into the sea, past beaches that are beautiful, wild and barren at the same time rarely out of sight of the Pacific. 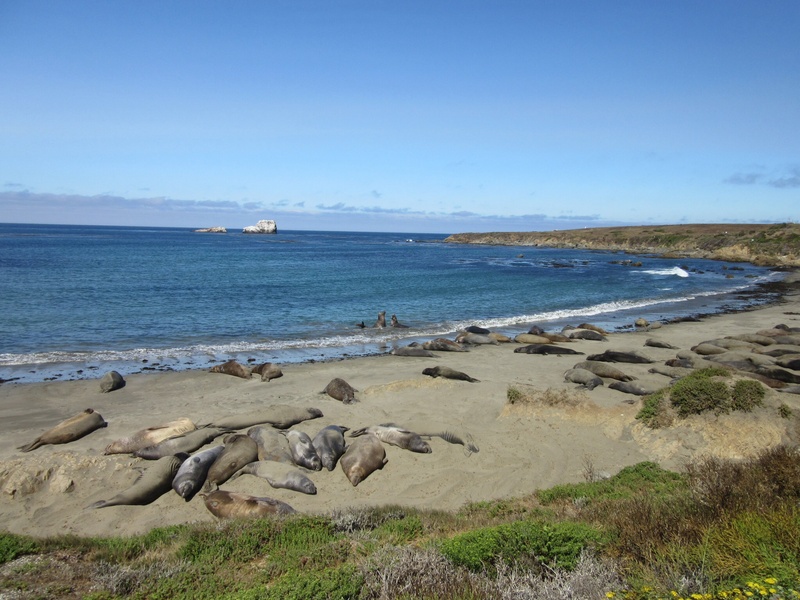 Rocks and cliffs jut out of the sea with waves crashing, and around the next bend a colony of sea lions basks on a beach. We spent the whole day on the drive, stopping to take photos and just enjoy the views. The road ranged from busy to fairly quiet, and for some stretches we were on our own. At other points, crowds can stop at the same place but it’s for good reason. 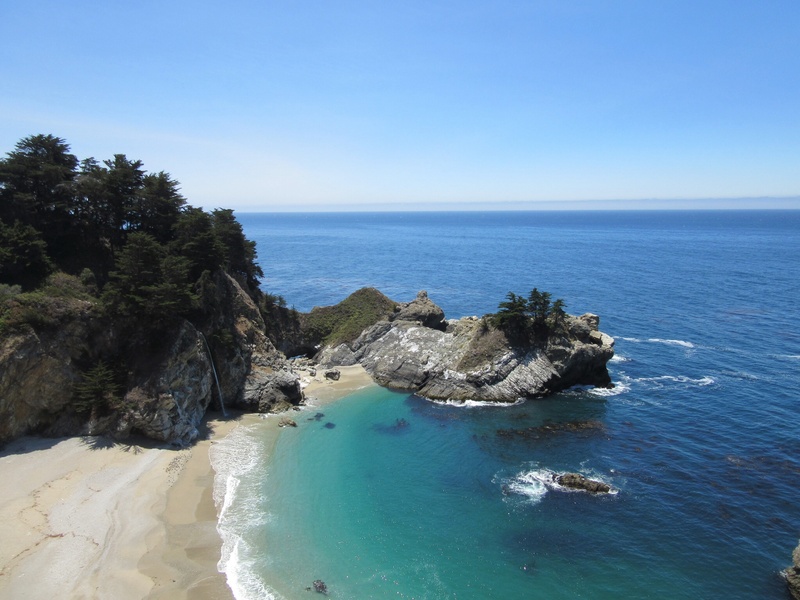 At Julia Pfeiffer Burns State Park, cars are stopped all along the road, and by hopping the fence and walking a short track you see why. A pristine cove, naturally sheltered, with a waterfall dropping right down onto the sand. 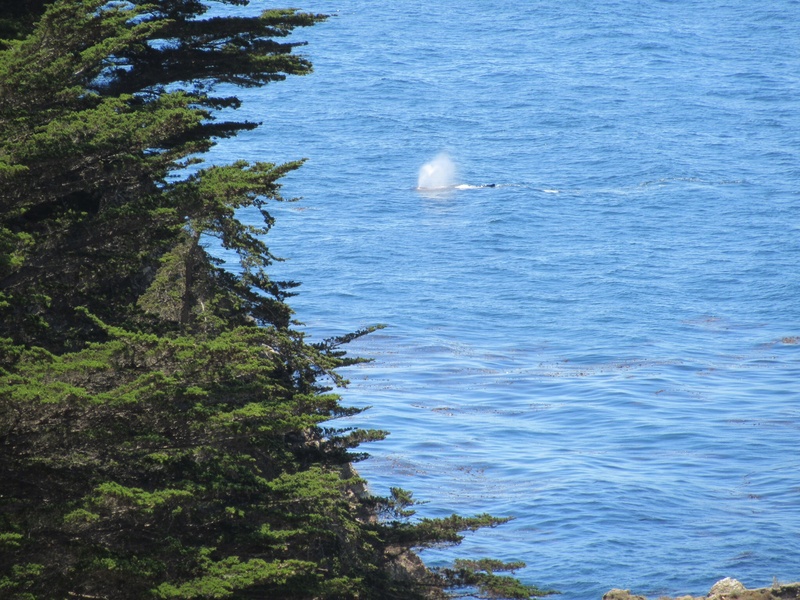 Just out to sea, a whale was swimming past, blowing and diving away. Amazing. And later, we just pulled off the road and made lunch, just us and the view. Thar she blows! Same whale as in Kaikoura? 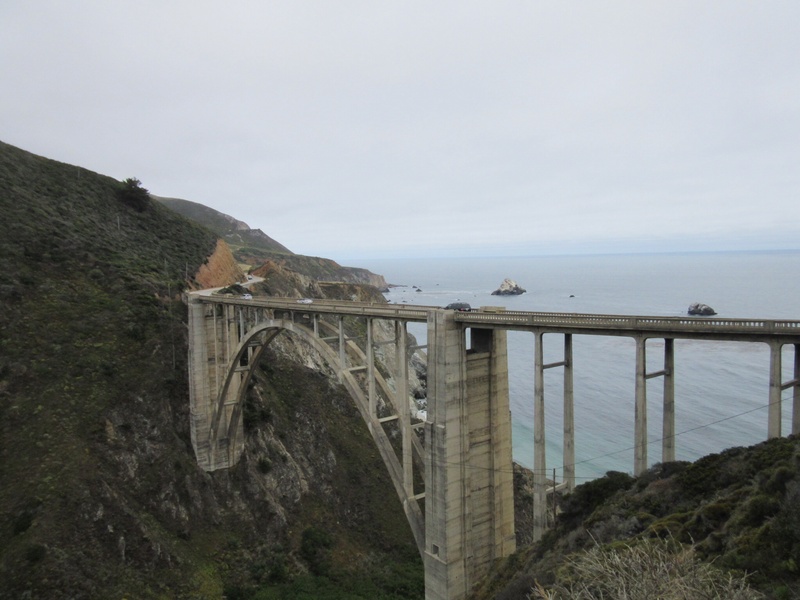 By the time we reached the famous Bixby Bridge, which spans a creek and is ridiculously photogenic, we had almost filled a memory card with images that will never do it justice. 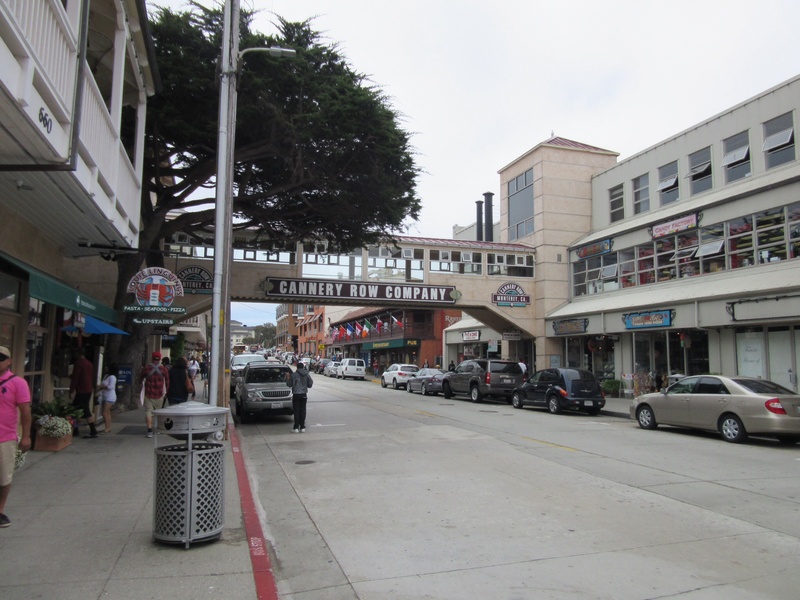 We did find the time and energy to explore the über-quaint town of Carmel, which was very pleasant if a little too posh for backpackers! Considering Clint Eastwood used to be the Mayor, the lack of Western/Dirty Harry memorabilia was disappointing! From there we finished up in Monterey, and spent the evening wandering around the town. Deciding to avoid the pricier food on the wharf, we ended up with massive burgers in a sports bar instead. 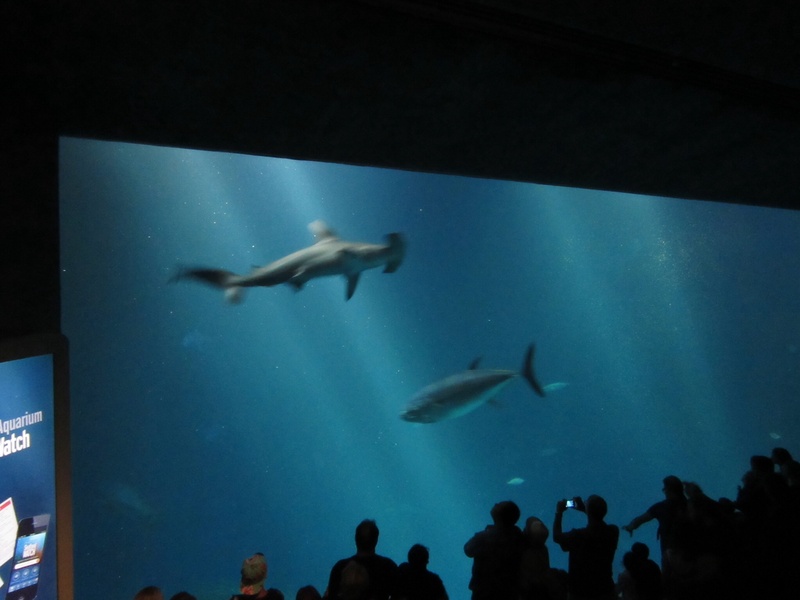 For our final day (for a little while) on the coast, we spent the morning around Cannery Row and in the Monterey Bay Aquarium. There are some amazing exhibits there, and the fact we got discounted entry tickets from the AirBnB host we stayed with helped us enjoy it even more. 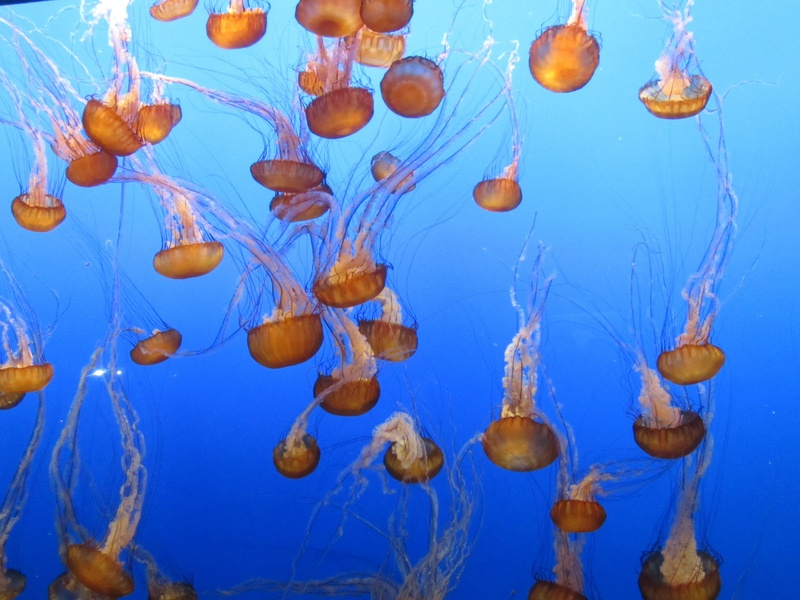 The giant fish tanks were awesome, the sea otters very cute, but the highlight was eerily lit jellyfish tanks. Very cool. Only a tiny bit of the route covered, but so far, the west coast is living up to the billing it got all those months ago.